When one has a special occasion to celebrate or an important client to impress, Lexington has 11 fine restaurants to choose from. What you are paying for is the chef, or chefs, who graduated from culinary school and interned in major kitchens elsewhere before coming to Kentucky; the service staff who quietly antiicipate the diners' every need; and the menu with creative entrees representing the cutting edge of 21st Century cuisine. Reflecting the national trend among top echelon restaurants, these elites have drastically reduced their menus to focus on fewer selections done exquisitely well. They focus great time and effort on their wine lists. The ingredients and preparation receive great attention, but what sets them apart is their presentation : the artistic appearance of the food is given great emphasis. These places all take pride in their history and tradition and continue their success through meticulous attention to detail. 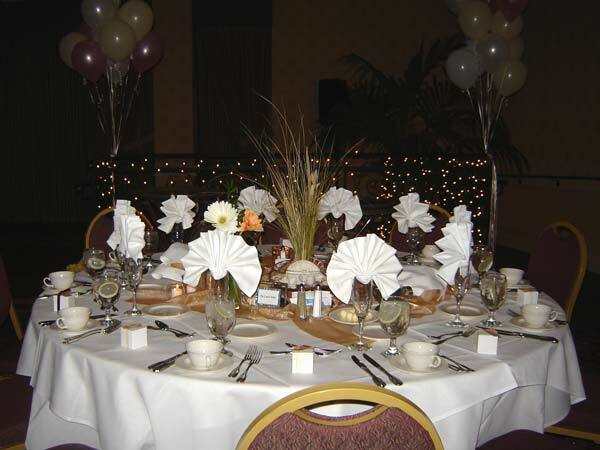 Reservations are assumed and arrival about 10 minutes early smooths the seating. A meal at one of these restaurants is An Event, to be anticipated and remembered. 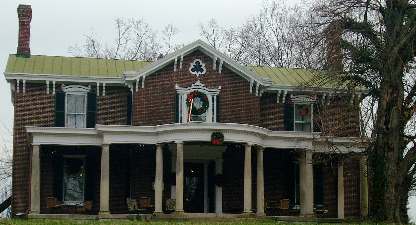 Holly Hill Inn. When national championship debater Ouita Papka announced that instead of going to law school she would attend the New York Culinary Institute and become a chef, coaches thought she was joking. Now they bring their teams to her award winning restaurant. 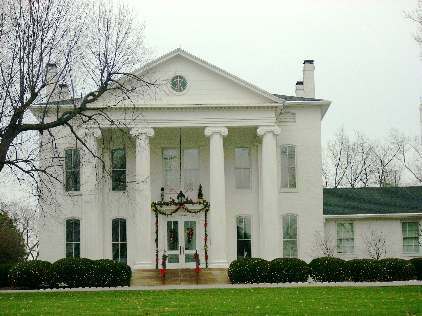 The 1812 Holly Hill Inn is an antebellum mansion 20 minutes from downtown Lexington. Most foodophiles rate it the best restaurant in Kentucky. Ouita and husband Chris Michel are chef and sommelier. 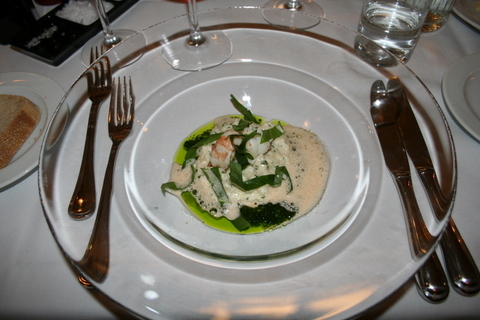 They use fresh, locally grown ingredients in a fixed menu of three, four or five courses at $35, $40 or $45. Their halibut and scallops are wonderful, but when available, the rabbit and squab are the stars of the entree show. Make sure the cornbread accompanies whatever you order. And while you can order your own wine, we suggest you let Chris choose one for you. Save room for dessert; Ouita's are special. Midway. 859-846-4732. From downtown, take Broadway north to !-64, go off at Midway, turn right on 421 and immediately turn left on North Winter Street. Holly Hill Inn is at 426, a block up the hill. 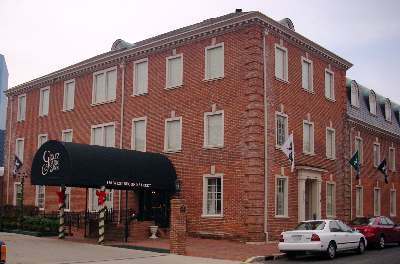 Merrick Inn opened as a restaurant in 1970 in the old mansion when Merrick Farm was developed as a townhouse complex. The old horse farm atmosphere still permeates the place, and longtime customers consider Merrick the best restaurant inside city limits. The menu is traditional Old South but each favorite is given new touches. For instance, the grilled shrimp are now served on cheese grits in Maker's Mark sauce. Fried green tomatoes now come in a shrimp lobster salad. And the chefs use their Daily Special board to add a contemporary flavor. One recent item has been the stuffed egg roll, a pork and shrimp base with cucumber, bok choy and Thai chili sauce. There's some real heat hiding in there, so be careful. The entrees include several kinds of fish, chicken, chops and steaks. The sides read like something out of Gone With The Wind : acorn squash, broccoli, spinach, macaroni and cheese, corn and grits. What breathes life into this nostalgia trip is that these may be the best versions of these classics you have ever tasted. The dessert list is another classic. We recommend the key lime pie, butterscotch pie and cheesecake. 3380 Tates Creek Road. 269-5417. 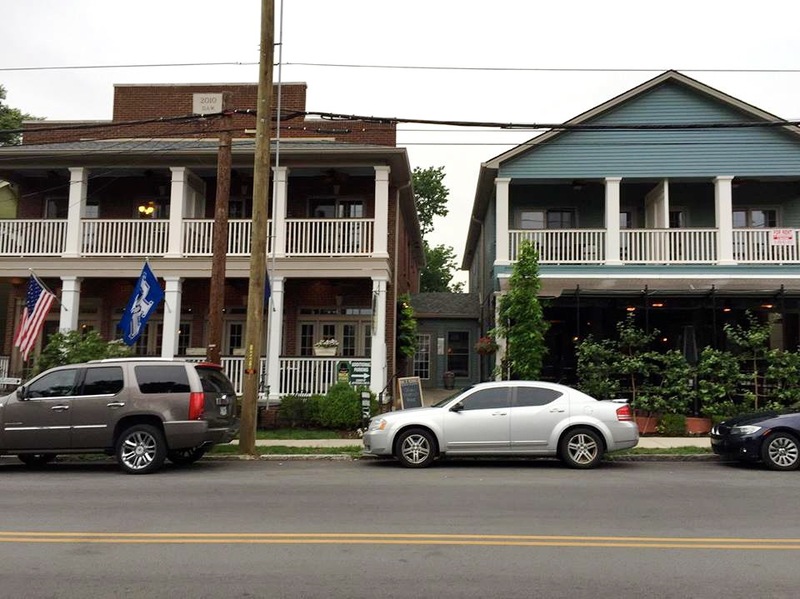 From downtown, go east on High Street, which turns into Tates Creek. When you come to the bottom of the long hill, with Lansdowne Shops on your right, look for the Merrick Place entrance on your left. Merrick Inn is atop the hill. Parking is a problem; use the valet system. Distilled is within the Gratz Park Inn. The kitchen uses locally sourced meats and produce, the ambience is simple, informal and unpretentious, and the food is Southern with a very creative 21st Century edge. We think the Country Ham Tasting, Vanilla Bourbon Roasted Parsnip Soup, Apple Salad and Habiscus Poached Pear Beet Salad are the stars of their Appetizer ("Enticements") menu, but there are Scallops, Halibut, a Cheese Plate and Lobster Salad. Entrees include Rabbit, Duck, Potato Gnocchi, Snapper, Braised Pork Shank, Sweet Glazed Short ribs and a Dry Rub Filet. Distilled is also open for Breakfast, Brunch and Lunch. At Breakfast you can try a Frittata, Grits & Sausage, a Fresh Fruit Yogurt Parfait, or Buttermilk Lemon Poppy Seed Pancakes. The Brunch menu offers Pimento Cheese Tartine, Hot Chicken & Waffles, Ham & Cheddar Omelette, Herb & Egg White Quiche and Crab Hoe Cakes. Lunch includes Tomato Gazpacho, a Crab Cake Sandwich, Tempura Fish Tacos, Diver Scallops and a Shrimp Po Boy. From Main Street downtown, turn North onto Limestone and go three blocks. Turn left onto Second Street. You'll see the rear of the building, shown here. Turn left into the Gratz Park Inn parking lot. 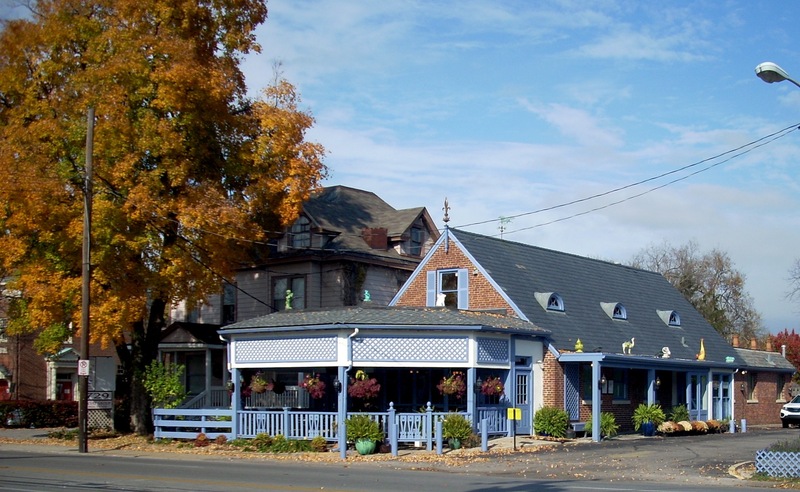 The Campbell House has outlasted several longtime rivals (The Coach House, Levas's, The Little Inn) and stands as the longest continuously running Special Occasion restaurant in town. When The Campbell House opened, many current rivals were still horse farm mansions. The Campbell House Inn has changed owners several times (the current one is Crowne Plaza) and the restaurant inside has changed names and been rethemed several times (most recently a multimillion dollar updating in 2005). But regardless of what The Inn names the restaurant, everybody just calls it The Campbell House and continues to eat there. The restaurant is popular with the UK football and basketball crowd and Keeneland racing fans, so when UK has a home game or the Keeneland Fall or Spring Meet is in session, it's hard to get a table. The current name is Kilburn's, but Friday Seafood Buffets and Sunday Brunch Buffets continue to draw crowds. For 50 years, The Campbell House has been popular after church on Sundays, and for Thanksgiving and Easter dinners. It takes special pride in its prime rib, but we didn't list it as a steak house because its seafood and other entrees are outstanding. Always order the soup and dessert of the day. The menu is basically Old South for the traditionalists, with daily specials to allow the chefs to show off their culinary skills. 1375 Harrodsburg Road. 255-4281. From downtown, two miles south on Broadway. 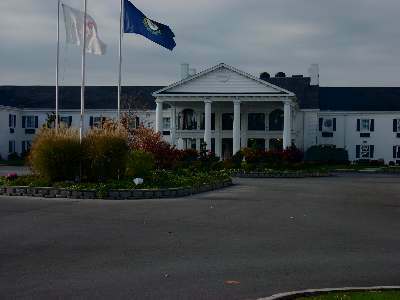 The Mansion has the grandest appearance of any Lexington restaurant. It was, indeed, a mansion, the antebellum home on the old Griffin Gate Thoroughbred Farm before it was developed with a golf course, elite housing and Marriott complex. High ceilings, intricate chandeliers, tasteful lighting, and 1800s furniture greet you upon entering. Then the Old South waiters usher you to your table and the menu takes over, featuring items like a lobster chive salad, turnip soup over walnuts and poached pear, pappardelle saffron with tomato ragou, and tomato basil mozzarella. Clearly, these people take appetizers seriously. The entrees are equally innovative and impressive. The sea bass with charred onions, beans and cilantro balances several flavors just right. Grilled venison with brussel sprouts, chestnuts, mushrooms and cider gastrique is a dinner you can't order very many places. There's prosciutto wrapped pork tenderloin, and filet mignon with South African Lobster. Save room for dessert. The three we like best are the creme brulee, peach bread pudding with caramel sauce, and cheesecake. The wine list is heavily French. We suggest asking for the sommelier's own recommendation to go with your order. 1800 Newtown Pike. 231-5100 daytime. 288-6142 evenings. From downtown, drive west on West Main Street, turn right onto Newtown Pike and follow it several miles past Lexmark and New Circle Road. When the golf course shows up on your right, slow down and look for the stone walled entrance to the Griffin Gate Complex. The Mansion is up the hill. 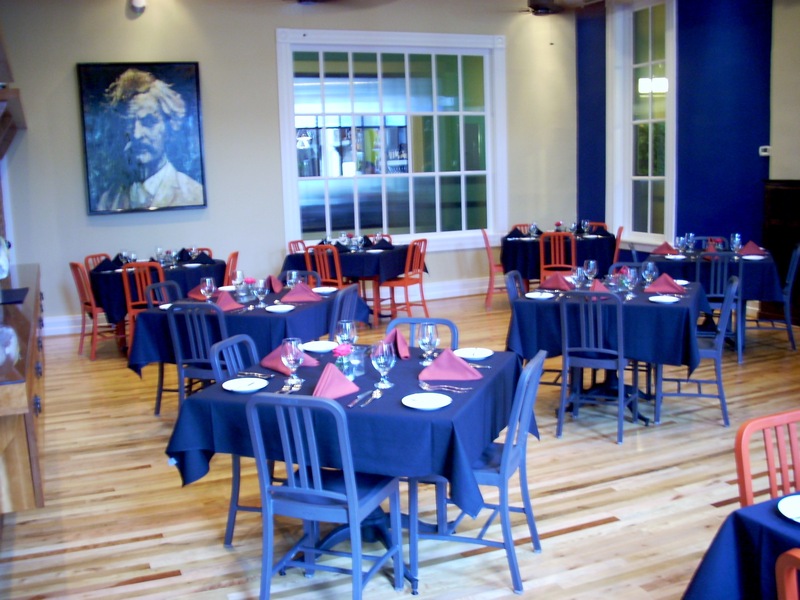 Sabio's is Lexington's newest Special Occasion restaurant. It's in the 1881 Lexington High School, remodelled as Dudley Square. 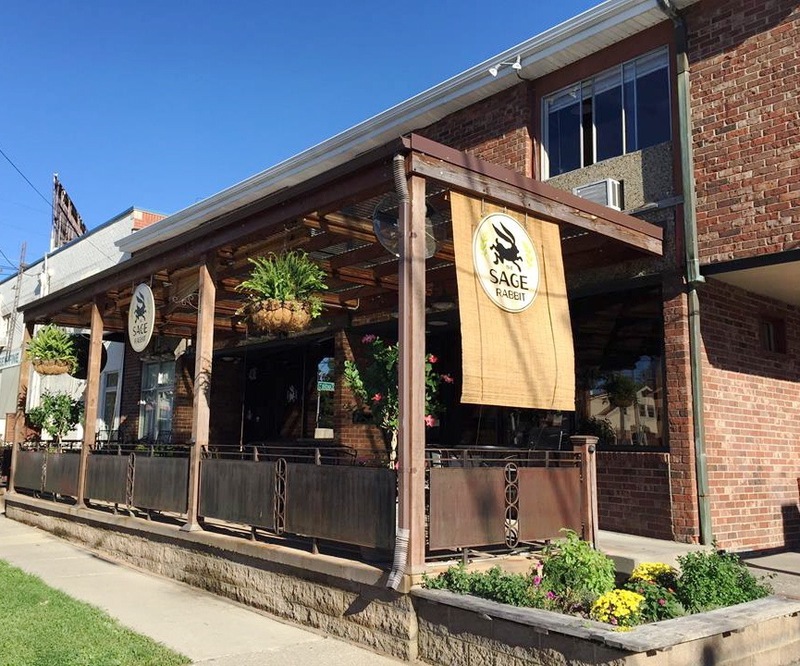 The beautiful hard wood floors, exposed brick walls, high ceilings and big windows are still there and Sabio's occupies three former classrooms plus a patio. The menu is one page with nine entrees : Vegetarian, Chicken Chardonnay, Pork, Duck, Lamb, Scallops, Filet Mignon, Salmon and Shrimp Gnocchi. Chef Julian Lanza is a local produce advocate and everything on the menu is delicious, but we think Sabio's may offer the four best Salads in town. They include Roast Beet Chivre (romaine, roast beets, candied roast walnuts, peppery chevre cheese), Fried Green Tomato (on a bed of mixed greens, smoked bacon, cheese and buttermilk dressing), Sabio (mixed greens, strawberries, red onions, feta cheese, candied pecans and maple mustard dressing), and Spinach (baby spinach, pears, daikon, golden sesame dressing). A Soup of the Day and French Onion Soup are offered at lunch. There's not room on the one page dinner menu for them, but they're available by request. You should definitely put in the request, because they're both very good. The menu opens with a Small Plate List. We can highly recommend the Goat Cheese Stuffed Quail, Lobster Tart and Potato Gnocchi. If you can save room for dessert, there's Roman Apple Cake, Banana Bread Pudding and Cinnamon Vanilla Custard. Cole's 735 Main features Classic Upscale Southern Cuisine. Among appetizers, we like the Spanakopita (spinach and feta souffle wrapped in phyllo with shallot cream), but the Fried Avocado stuffed with crab salad and the Sea Cake are excellent. The Roast Beet & Goat Cheese With Arugula is the finest interpretation of this salad in Kentucky. The 14 item entree menu includes Beef Shoulder, New York Strip, a Petite Filet and Duck Breast. Cole's does not advertise itself as a Seafood restaurant, but no seafood restaurant in town matches the Shrimp & Grits and Scallops served here, and the Tuna, Salmon and Seafood Medley are also outstanding. Ribs fans will find Baby Back Ribs or Short Ribs excellent. There's Amish Chicken with mushrooms and spinach. For vegetarians, Morrocan Butternut Squash Stew includes garlic whipped potatoes and lemon shallot brussel sprouts. A Bar Food Menu, available by request, is a bounty of items below $12 : Spicy Duck Tacos, Salted Endamame, Baked Brie, Duck Fries, Wild Mushroom Bruscetta, Artisan Cheese Plate and the Kobe Burger. 735 East Main. From downtown, drive East on Vine / Main, and look left. Sage Rabbit is Chevy Chase's Special Occasion restaurant. Chef John Foster (French Culinary Institute, formerly of Harvest Restaurant) has long been committed to locally sourced and seasonal ingredients, knows how to manage a kitchen, and plans a creative menu. The patio, especially in the Spring and Fall and on Summer evenings, is a great place to enjoy a meal. Pastas and Pastries are prepared in house daily. The menu rotates with the seasons, but we really like their Cream of Roast Tomato Soup, Mixed Green Salad and whichever Pasta they're offering each day. Among entrees, the Scallop-Shrimp Bouillabaisse is their signature dish, but the Crab Cake and Seasonal Seafood are very good, indicative of Foster's training in Manhattan. But if you're not into Seafood, the Local Organic Half Hen is exquisite. Or try the Roast Pork or Beef Tenderloin. Desserts are rich and sinful, and beverages include Earl Grey Tea, San Pelligrino, Organic Coffee, Ginger Ale and Fenterman's Cherry Cola (imported from British Columbia). Jefferson Street has become a popular strip of restaurants, but Nick Ryan's is still the anchor. It's a great place for a Special Occasion dinner, Friday night date, or out of town guests. It fills two buildings and the ambience is open, sleek and relaxing. As you would expect from a saloon in business since 1905, drinks are creative and there's a classy wine list. But it's the food you go for. They take a basic like Tomato Soup and do it very, very well. Appetizers include Crab Cakes, Shrimp Wraps, Mussels, Oysters and Ravioli. Salads are unique: Shrimp & White Bean, Beet & Goat Cheese and Tuna Nicoise. Entrees range from Southern Comfort Food to 21st Century Cutting Edge. Shrimp & Grits are a good example. It's a common item, but these are Weisenberger Mill smoked gouda andouille grits, shrimp veloute (onions, peppers and chicken broth) and free herbs. Crab Cakes come in a white wine whole grain mustard sauce on mashed potatoes and veggies. Ryans dusts their Catfish with corn meal and serves it on asparagus. There's Gnocchi, Short Ribs, Clams, Jerked Chicken, Filet Mignon and Salmon. And there's Ryan's own interpretation of Kentucky Hot Brown (country ham, roast turkey, bacon, tomato, cream sauce and cheeses). This one uses the recipe from the old Stirrup Cup restaurant down on Main Street. Some items are only available as daily specials : White Bean & Ham Soup and Butternut Squash Ravioli. On weekends, go early. After 7, you'll face a long wait. 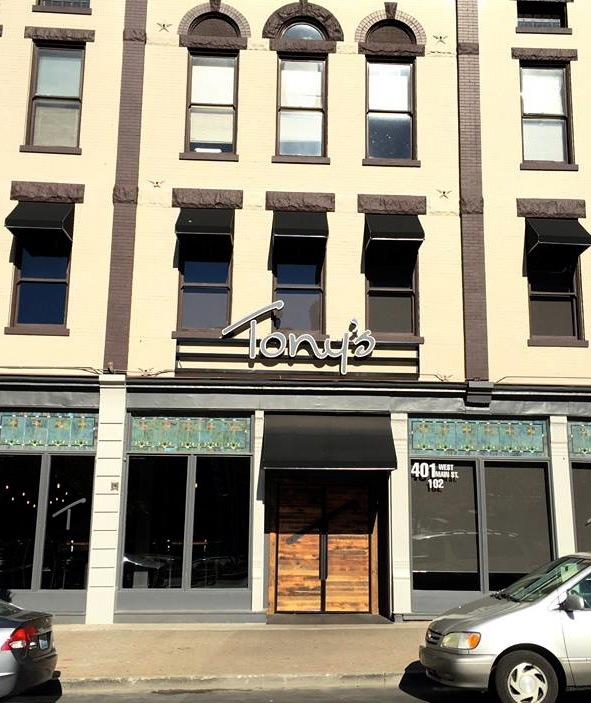 Tony Ricci has invested heavily in his attempt to make Tony's the premier restaurant in Lexington. He has a good start with its location across from Rupp Arena. It's the only downtown restaurant offering valet parking. The decor is classy, and the menu touches all the bases. The Raw Bar serves Oysters and Alaskan King Crab. Appetizers include Crab Cakes, Calamari, Steak Tartare, Mussels and Seared Tuna. There are six Salads and six Pastas, of which our favorites are the Pappardelle Fra Diavolo (heavily peppered shrimp, tomatoes, black olives, roast peppers and spinach), Pasta Pescatore (shrimp, mussels, scallops, clams, linguine, cherry tomatoes in a lobster saffron sauce) and Pistachio Pesto Orechiette (grilled chicken, parmesan, asiago and romano). Seafood includes Scottish Salmon, Chilean Sea Bass, Blackened Yellow Fin Tuna, Shrimp & Grits ande Lobster. Other Entrees are Lamb, Ribs, Pork Chops and Chicken. The Sides refuse to be upstaged by all this. The Five Cheese Mac & Cheese is very good, Creamed Spinach better, and Bourbon Whipped Sweet Potatoes With Homemade Cinnamon Maple Marshmallow memorable. Which, finally, brings us to the Steaks, Ricci's main focus. These are good steaks, well prepared (although the kitchen has a habit of fumbling the order, as in well done instead of medium rare, then tries to redo the same steak to fit the other preference, an unforgivable offense at a premium restaurant). There's Filet Mignon, New York Strip, Porterhouse and Ribeye, with or without Bone In. The problem is price. These Steaks range from $40 to $65, and even the other Entrees range in the $30s. In a predominantly Middle Class city, this makes Tony's a Special Occasion restaurant for most people, an expense account stop for business executives, and a one time experience for visiting sports fans. Lexington has a lot of restaurant options. Maintaining a large enough customer base with these prices will be a challenge.